WASHINGTON, (AP)—S. Sgt. Herschel F. (Pete) Briles, a tall Iowa farmer who wants to go back to tilling the soil, Monday was holder of the Congressional medal of honor, the nation’s highest decoration for bravery. The six-foot-two native Iowan who rescued four wounded comrades from two shell-smashed, flaming tank destroyers and forced surrender of 55 Germans in two days of fighting, was the third soldier from Iowa to win the award. He now is visiting in Iowa. Lt. Dale E. Christensen, Gray, Ia., and Capt. Darrell R. Lindsey, Fort Dodge, Ia., each has been awarded the decoration posthumously. Enemy artillery had opened up on a tank destroyer platoon which Briles was leading and a shell struck a destroyer several yards behind Briles’ vehicle. The direct hit set the destroyer ablaze, killing one crewman, and injuring two others. Braving artillery, machine-gun and rifle fire, Briles ran to the crippled destroyer. Turned back momentarily by flames as he tired to get in its turret, he beat out some of the flames with his bare hands and crawled in. He carried out the two wounded men, and returned to quench the blaze with a fire extinguisher. The following morning, Briles sighted German infantry advancing against the American lines. The Iowan drove his destroyer against this force, penned it in with deadly fire from his machinegun, and forced 55 Germans to surrender. A junction between American units which had been held up for days was facilitated by this action, which eliminated a German wedge. Again the same day, Briles, with the help of another soldier, evacuated two wounded under heavy fire, after a shell had hit and set fire to another of the platoon’s tank destroyers. Risking death from exploding ammunition, Briles returned to put out the blaze. Briles is a veteran of campaigns in North Africa, Sicily, Italy, the D-day invasion in France, Belgium and Germany. He was among the first to cross the Rhine. He holds the bronze star medal for gallantry in action against the Germans last September and wears the purple heart for shrapnel wounds suffered in Germany. He was ill at the time of the action last November, his medal of honor citation said, but he refused to leave his post. With the announcement of the award was made Sunday, the 180-pound sergeant was relaxing at Mitchellville, Ia., visiting Miss Mabel DeVoto. His father, William Briles, formerly of Colfax, now resides at Covington, Ind. He has a sister, Mrs. Frank Morgan, at Colfax, and she reported Briles planned to return to farming with his brother-in-law, Ted Schlosser, who lives near Ankeny, Ia. Washington, D.C. (U.P.) President Truman personally welcomed 28 American fighting men into the nation's hall of heroes Thursday in the largest mass ceremony of its kind. Two of the award winners are from Iowa: Sgt. 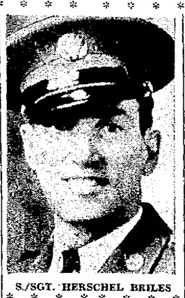 Ralph G. Neppel, of Glidden, who lost both legs and Staff Sgt Hershel F. Briles of Colfax. In the crowded east room of the White House, the chief executive solemnly fastened the Medal of Honor, the nation's supreme award for valor, about the necks of 24 heroes from the war in Europe and four from the Pacific battle fronts. More than 300 mothers, fathers, brothers, sisters and sweethearts - many of them awed and noticeably nervous - sat quietly in the chandeliered east room of the executive mansion as the World War II heroes stepped up to the president one by one, saluted and stood stiffly at attention. After the last medal was awarded, the president stepped to a microphone in the east room and made a short speech. "When leadership is required, no matter what the emergency, " he asserted,"it comes to the top in the young men of America. These men, who loved peace, were able to adjust themselves to the needs of war and turned out to be leaders." All of the heroes were members of the army. Their 28 awards bring to 196 the number of Medals of Honor awarded to army personnel since World War II began. A part of the United States army band played softly in the White House lobby as the heroes and their families were ushered into the east room. Mrs. Truman greeted many of them personally as they entered. The soft strains of "Hail to the Chief" heralded the entrance of the president and the simple ceremony began. Mr. Truman smiled at the crowd, then looked respectfully at the 28 khaki-clad men to whom he was to award the medal which he, himself, has said would be a better possession than the presidency of the United States. As a leader of a platoon of tank destroyers of the 899th tank destroyer battalion, 47th regiment of the 9th division, Sergeant Briles, 31, twice entered the hulls of burning tank destroyers to rescue trapped comrades last Nov. 20 and 21 near Scherpenseel, Germany. Sergeant Neppel, 21, as a machine gun squad leader, calmly ignored a charging tank and wiped out 20 Germans who were assaulting his position near Birgel, Germany, last December 14. The fighting member of Co. M, 329th infantry regiment of the 83rd (Ohio) division, was blasted from his gun position by a high velocity shell from the tank. A fragment severed his right leg below the knee, with the enemy closing in only 30 yards away, he dragged himself to his gun, killed the remaining Germans, and without the support of riflemen force the tank to withdraw. T/4 Arthur O. Beyer, 36, Ogema, Minn, was an artilleryman by assignment but was fighting as an infantryman last Jan. 15 in Belgium when he stalked a string of German foxholes, killing eight Germans and capturing 18 others. He was a gunner of Co. C, 603rd tank destroyer battalion, 6th armored division.